Let Them Eat Jam was a site-specific, time-travelling fairytale created with the people of West Cumbria at Rosehill Theatre in March 2012. Exploring the rich history of the local area, the show took audiences on a whirlwind journey through the theatre to interact with a love story that spanned 40 years. From Spring 2011 Coney made regular trips to Whitehaven in West Cumbria as part of an intriguing comission from West is Best to create a brand new piece of community theatre with Rosehill Theatre. Aiming to respond to the stories and histories that we found, we spent several weeks immersing ourselves in West Cumbrian life, meeting more than 100 locals aged from 9 months to 90 years. From these conversations certain themes and stories began to emerge, including the centuries-old (and largely playful) rivalry between Workington and Whitehaven folk from which the name of the show came. The fairy godmother-style narrator of show was also based on a real-life Whitehaven character who several ladies remembered from the 1940s-60s. Mrs Eve Ross was a charismatic manager to hundreds of young women at Edgard’s military clothing factory, one of which was Mrs Sally Jones who supplied us with anecdotes and photographs of Mrs Ross. Another local expert we met was Ray Devlin, a paratrooper turned miner, who shared his experiences with the miner in our story. A former employee of Edgard’s, Frank Leuthwaite, was invaluable to the development of the show with his encyclopedic knowledge about West Cumbria that spanned 50 years. We wove the stories and characters of the area into an interactive love story that would unfold across several spaces in Rosehill Theatre, with locals involved with every aspect of the piece as an ‘authenticity advisory panel’. This involved ensuring that the Cumbrian slang in the script rang true and a crew of over 70s helping designers achieve the 1960s aesthetic. 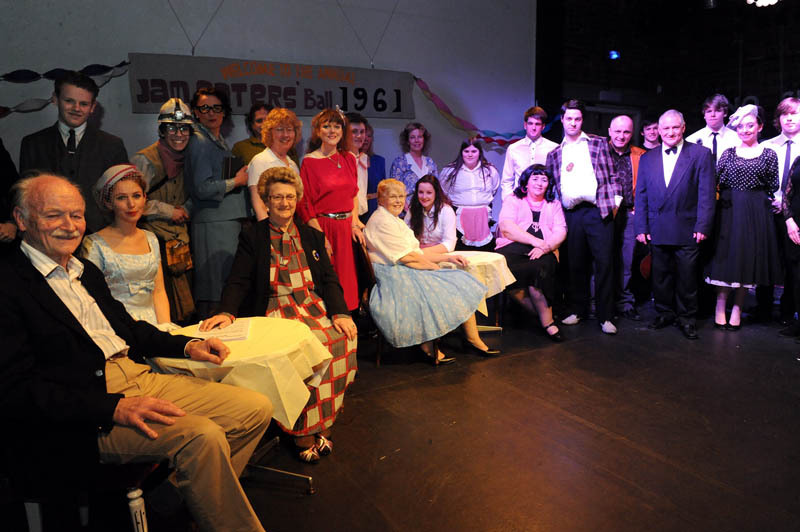 22 community performers and 4 professional performers aged 16 to 75 joined to form the talented cast. As with all of Coney’s work the audience of Let Them Eat Jam were invited to co-author the experience of the show, making choices about which path a character should follow and interacting with the story. But the ultimate collaboration came from working with local people to bring their own memories to life on the stage. Coney was here represented by Annette Mees, Mimi Poskitt and Tom Bowtell.